Active dues paying Student Members receive a discount when registering. Login or Join now in order to obtain the special Student Member discount. Banquet registration is now closed. If you are still interested in attending the banquet, a few tickets may be available at on-site registration. 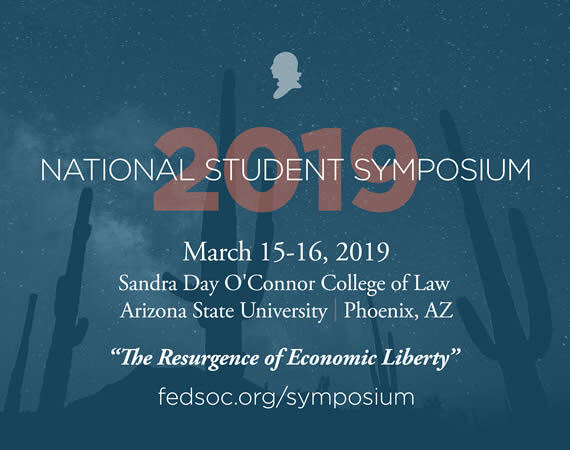 The Federalist Society is excited to announce that the 38th National Student Symposium will be hosted by the Arizona State University chapter at the Sandra Day O'Connor College of Law in Phoenix, AZ. The theme for the Symposium will be “The Resurgence of Economic Liberty.” Select sessions from the Symposium will be livestreamed. Click on the agenda tabs to view the videos. The story of the American founding is inextricably linked with a quest for economic liberty. From restrictions on trade to heavy taxes, tyranny in the economic sphere is one of the most commonly cited abuses of governmental power that sparked the American Revolution. Economic theories played a central role in the debates leading to the Constitution’s ratification. In discussing factions, relations among the states, congressional powers, and other fundamental constitutional themes, the Founders recognized the critical ways in which the ideas of liberty, justice, and equality could only be realized through an understanding of markets and related economic interests. Indeed, the “American Dream” itself can be characterized in terms of economic self-determination, including the right to choose a profession, earn a livelihood, and buy and sell on the same terms as fellow citizens. The twentieth century witnessed a vast expansion of governmental power and the administrative state, which some scholars have argued has distorted the Framers’ original constitutional design—all with a profound impact on economic liberty and welfare, and thus the way of life for millions of Americans. Today, Americans remain deeply divided over the meaning and importance of economic liberty, and, as a result, the topic often animates social discourse and decision-making at all levels of government. The question of how much the government ought to intrude into the economic realm is a fundamental fault line that divides not only American conservatives and liberals, but also conservatives and libertarians, as well as adherents to various schools of thought within each of those political philosophies. 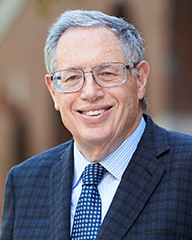 As a matter of constitutional interpretation, even staunch originalists disagree with one another over the extent to which the nation’s charter protects economic liberty. The Symposium’s panels will focus on the legal and philosophical roots of economic liberty and explore how those roots should inform jurisprudence and political thought in addressing contemporary issues. The panels will delve deeply into first principles underlying our constitutional scheme as well as explore their application to cutting-edge technologies, regulatory schemes, and business models. We will challenge attendees to deepen their understanding of the relationship between economic liberty and legal rights, and to test personal economic beliefs against commitments to originalism and the rule of law. Visit the official Symposium website here. Is Lochner v. New York Constitutionally Indefensible? 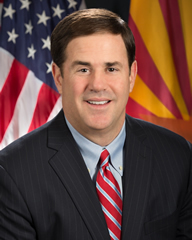 We're thrilled to announce that Arizona Governor Doug Ducey will be our Keynote speaker at the Saturday evening banquet. Governor Ducey was the CEO of Cold Stone Creamery before becoming Arizona's 32nd State Treasurer. In 2014 he was elected the 23rd Governor of Arizona. 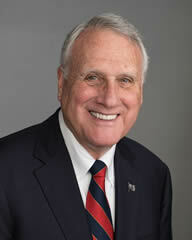 This will be a "fireside chat" moderated by Senator Jon Kyl (AZ), former member of the U.S. House of Representatives (AZ) (1987-1995), Senate Minority Whip (2007-2013), Chairman of the Republican Policy Committee (2003-2007) and Republican Conference (2007). Visit the official Symposium website for panel descriptions. Rather than reserve a block of rooms at a predetermined hotel, ASU Law has embraced the symposium theme of economic liberty and provided Symposium attendees with a link through which you can access all ASU-wide hotel special hotel rates in the Phoenix area. This optimizes consumer choice, and hopefully will lead to more efficient outcomes. That said, Phoenix hotels book very quickly during March with great weather and lots of Baseball Spring Training going on in the area. Make sure to book your hotel rooms early! The hotel where most non-panel events will be held is the Sheraton Grand Phoenix Hotel, located directly across the street from ASU Law at: 340 N 3rd St., Phoenix, AZ 85004.